…but at least they released the trailer for the new Star Wars film. 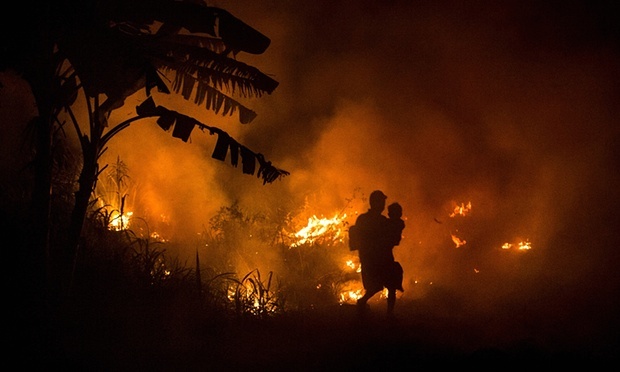 Children are choking to death and being prepared for evacuation as forest fires ravage Indonesia in what is probably the most severe environmental disaster of the 21st century. Endangered orangutans are losing their homes and food sources, which, obviously, has a severe knock on effect for their survival. Every day, the carbon emissions from these fires equals those from the USA, and we all know how much Americans love to be “green”. “Apocalyptic hellish scene” said Ben Henschke of BBC Indonesia. This is a tragic event of unparalleled proportion, but what is this culture talking about? Star Wars! What is the (extremely) probable cause of this devastation? Corruption and corporate greed! Already there is palm oil being grown illegally on the decimated remains of the forest homes of orangutans. Palm oil giants, sourcing from independent smallholders, are profiteering from what is choking children to death, but what trends on Twitter? Star Wars. Keith, formerly a long-time vegan herself, explicitly acknowledges and honors the morals, values, and passion that vegetarians and vegans bring to the struggle against factory farming and unethical and destructive food production. But she asks them to examine these “vegetarian myths” to get to the root causes of our horribly dysfunctional systems. Throughout the conversation, she stresses the primary problem of civilization and its prerequisite of agriculture, which requires a shocking amount of energy to fight nature. Maintaining monocrops is a never ending war. Whether to feed caged animals on concrete, or to directly feed humans, this is a war we can’t afford to win. Read a transcript of the interview or watch the video below, and if you’d like to learn more, we highly recommend reading the full book: The Vegetarian Myth by Lierre Keith. For more videos featuring Lierre Keith, the other DGR authors, and DGR members, visit Deep Green Resistance on Youtube or our Member Appearances page for both audio and video. The last 10,000 years, the length of agricultural civilization as a way of life, has been an unmitigated disaster for soil. In many regions, the soil has been completely eroded, compacted, denuded, salinized, or otherwise destroyed. This has been the fate of the “Fertile Crescent”, of North Africa, Ethiopia, the Mediterranean regions of Europe, much of Eastern Europe, and of much of the interior of China, Mongolia, and India. Other regions have ‘merely’ suffered a massive decline in soil health and thickness – this includes all the major food-growing regions of the world: the Sahel, the American Great Plains, the Pampas, and a wide swathe of Central Europe and Eastern China. In a natural state, the lands tends towards a climax ecosystem – a mature system that maximizes biodiversity, soil production, and complexity. When a disturbance occurs, such as a flood, a fire, or a civilization, bare soil is exposed. Exposed soil is a planetary emergency. It is an open wound on the skin of Earth. Like our body responds with blood and clotting, Earth responds with a first aid crew – weeds, grasses, and other quick-growing annual plants. These plants quickly cover the soil and begin to heal the wound, preparing the soil for perennial grasses, shrubs, trees, or whoever else belongs there.